Tastings, dining and music are all part of springtime events at our four local wineries. Take advantage of the good weather and enjoy a day or evening at one of the following fun events. Hidden Lake Winery in Aviston is known for having a roster of fun activities throughout the year, and this spring is no different. The Spring Festival, scheduled for April 13, 2019, brings together wineries, breweries and craft vendors for a day of tasting and shopping. Music will be provided by the Presswoods. On May 11, a Jazz Festival comes to the winery, featuring music by The Kevin Mtchell 4. Visitors can purchase a picnic basket with one or two bottles of wine to enjoy during the music. And on June 1, Retro Boogie music fills the winery for a Catalina Wine Mixer. The winery also has music every Friday and Saturday evening and Sunday afternoon and dining specials on Thursday evenings. The Spring Festival, April 13, 2019; 2:00 p.m. -11:00 p.m.
Jazz Festival: May 11, 2019; 6:00 p.m. -10:00 p.m.
Catalina Wine Mixer: June 1, 2019; 7:00 p.m. – 11:00 p.m.
Monday-Wednesday, 11:00 A.M. – 5:00 P.M.
Thursday, 11:00 a.m. – 9:00 p.m.
Now a tradition, the Easter Brunch at Bretz Wildlife Lodge and Winery is a wonderful way to treat mom—and one that the whole family will enjoy. The expansive feast includes breakfast favorites plus dinner specialties, including fried chicken, ham, and beef brisket with a range of delicious side dishes and desserts. Stop by the winery any weekend and enjoy music with some of the area’s favorite performers; Friday and Saturday evenings or Sunday afternoon. Mother’s Day Brunch, May 12, 2019, 9:00 a.m. – 1:00 p.m.
Monday and Wednesday, 3:00 p.m. – 9:00 p.m.
Friday – Saturday, 11:00 a.m. – 2:00 a.m.
Sunday, 11:00 a.m. – 8:00 p.m.
Twelve Oaks Vineyard opens for the 2019 season on Saturday, April 6. Pay a visit to taste its newest release, Vidal Blanc. You’ll also be able to meet and visit with the growers of the grapes used for this wine, Mike and Laura Wilke of Wilke Vineyards. Tasting Room: Saturday – Sunday, 1:00 p.m. – 6:00 p.m.
Springtime at Crooked Creek Winery brings a whole new family of wines to explore. The new E’ry Day Wines in red, white and rose are specially blended for quality and easy everyday drinking. The winery opens on April 6 for the season, so plan a visit any Saturday or Sunday after that to taste the wines and pick up a bottle or two to take home. 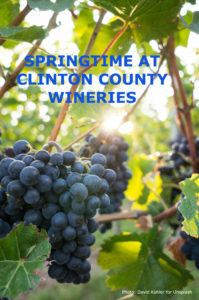 Hours: Saturday – Sunday, 12:00 p.m. – 6:00 p.m.
Let’s raise a glass to the great wineries of Clinton County! This entry was posted in Events, Food & Drink, Local Businesses, Music & Theater, Winery and tagged Clinton County, Clinton County attractions, Clinton County business, Clinton County dining, Clinton County entertainment, Clinton County event, Clinton County tourism, Wineries by admin. Bookmark the permalink.